Determined by a financial measure, the Champion Sire and Champion Broodmare Sire titles tend to favour horses who have plenty of progeny as their earnings accumulate faster than horses with smaller crop sizes. Critics of this measurement should, instead, think positively about this. Many stallions serve big books, yet only the best make it to the top of the table. And only a very few horses earn multiple sire titles. Stallions with less progeny might have a disadvantage under this system, but an astute buyer understands they can use other measures to find value buying, thanks to a lower profile for that stallion. Data for the Champion Broodmare Sire title only goes back to 1950-51, while the Champion Sire title is available back to 1883-84 when St. Albans (Blair Athol-Pandora by Cotherstone) won. In the past 65 seasons (1950-51 to 2014-15), there have been 26 individual champion sires, among them are 16 stallions who won a title more than once. During the same time period, there have been 31 individual champion broodmare sires including 13 multiple winners. 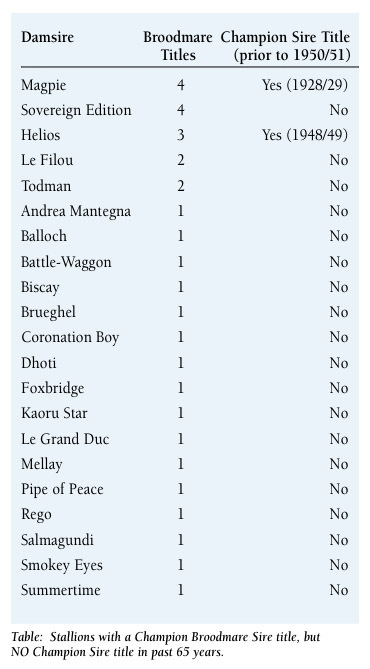 By matching the two lists, we get a complete list of 47 stallions who were crowned as a champion during the past 65 seasons. Only 10 of these superior stallions gained both a Champion Sire and a Champion Broodmare Sire title, and all 10 had multiple titles in at least one of these categories. 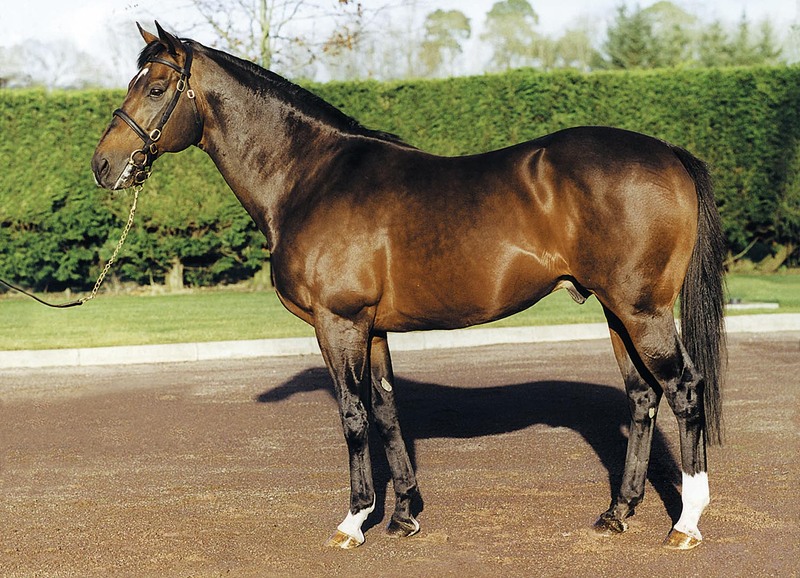 The standout is, of course, the masterful Danehill (Danzig-Razyana by His Majesty) with nine sire titles and seven broodmare sire titles, but each of these 10 stallions needs little introduction to breeders. 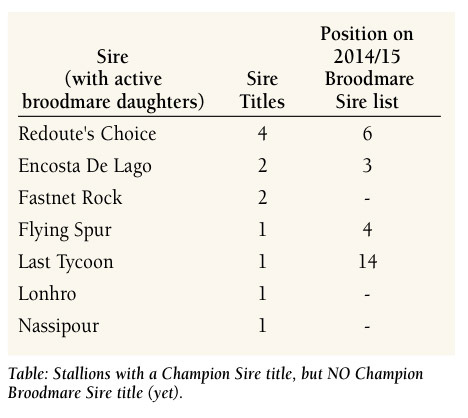 For pundits of the theory that champion sires make champion broodmare sires, the news is mixed. In 55% of the past 65 years, the sire and broodmare sire titles have been won by a horse who has picked up both titles in his career. However, this only amounts to 21% of individuals, so there is a case to say that this is not really correct either. 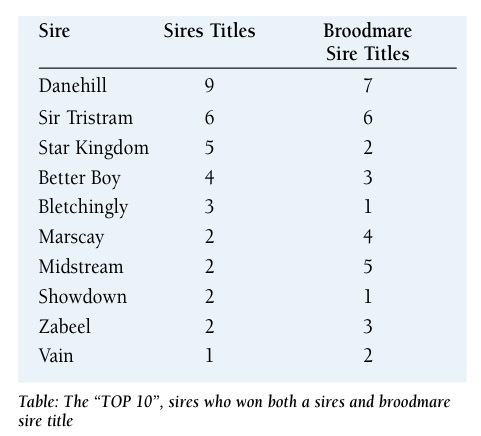 Outside of the top 10, there are 16 individuals who won a sires’ title and no broodmare sire title; and in reverse 21 who didn’t win a sires’ title, but collected a broodmare sire title. Some of these 16 Champion Sires are young, and their daughters are only just starting to produce progeny of racing age. In time, perhaps some of them will grace both lists. With Redoute’s Choice (Danehill–Shantha’s Choice by Canny Lad), Encosta de Lago (Fairy King-Shoal Creek by Star Way) and Flying Spur (Danehill-Rolls by Mr Prospector) all occupying top 10 places in last year’s broodmare sire title race, they may pick one up in time. Other young stallions on this list include Lonhro (Octagonal-Shadea by Straight Strike) and Fastnet Rock (Danehill-Piccadilly Circus by Royal Academy), both with daughters who have already left stakes winners. Lonhro’s daughters have left a pair of Gr.3 winners, Serene Majesty (Fastnet Rock-Custard by Lonhro) and Shards (Medaglia d’Oro-Shatters by Lonhro). Fastnet Rock’s daughters have only left 130 foals so far, including Gr.3 winner Shees Flawless (Fully Fledged-Dee Flawless by Fastnet Rock) and a pair of Listed winners, Pearl Star (Star Witness-Pearl of the Sea by Fastnet Rock) and Sunset Rock (Domesday-M’Indigo by Fastnet Rock). In the past 65 seasons, there have been 31 stallions to win a Champion Broodmare Sire title. Taking out the top 10 (who also won sires’ titles) leaves a list of 21 stallions (and only five of these won the title more than once). Only two of these stallions, Magpie and Helios, did earn a Champion Sire title, but outside the time period covered. There are three others who won multiple broodmare sire titles, Sovereign Edition (Sovereign Path-Latest Edition by Solferino), Le Filou (Vatellor-Fileuse by Casterari) and Todman (Star Kingdom-Oceana by Colombo). Each of these three were splendid sires in their own right, but missed out on the major title in Australia. 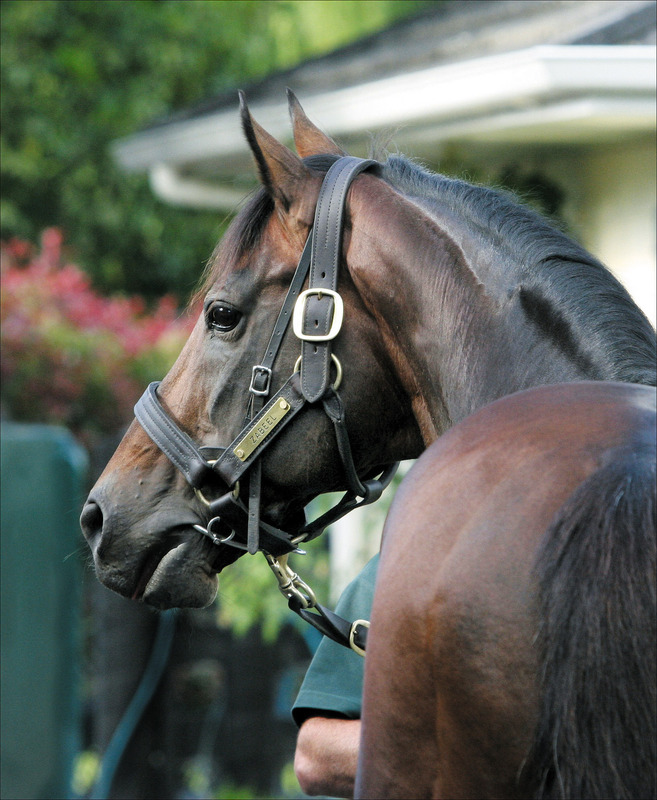 However, Sovereign Edition won Champion NZ Sire in 1976-77, while Le Filou was four times NZ Champion Sire. If there is one thing that seems obvious when running the eye over these lists, it is that the names on the broodmare sire list are not always the ones most racing folk remember as major stallions. One name in particular doesn’t seem to fit. Andrea Mantegna (Ribot-Angela Rucellai by Rockefella) had only 83 foals in the northern hemisphere for one Gr.1 winner. His daughters had 85 named foals, for four stakes winners, but his influence will always be remembered fondly in Australia as his German born daughter gave us Kingston Town (Bletchingly-Ada Hunter by Andrea Mantegna). She also left two other stakes winners, a Gr.2 winning brother Private Thoughts, and Listed winner Hunting Boy (by Claude).